Maybe it goes back to memories of reading “Little House on the Prairie,” when Laura would help Ma preserve the summer harvest to eat throughout the winter—but there’s something comforting about a jar of pickles. Though they seem quaint and old-fashioned now, homemade pickled veggies were a pantry staple in those days—just like salted beef and fresh-churned butter. Cooks have been preserving vegetables in brine for centuries—years and years before Laura Ingalls Wilder ever wrote about the little house in the big woods. In fact, archaeologists have found evidence of pickling as far back as 2030 BC. Julius Caesar fed his troops pickles in hopes of improving their strength. Queen Elizabeth I is also said to have been a fan, and Shakespeare riddled his plays with references to cured vegetables. And today, we’re still happily layering sliced dill spears on sandwiches and chasing sushi with pink pickled ginger—though most people probably wouldn’t know the first thing about old-fashioned pickling. Luckily, there is an easy way to replicate this technique at home—one that doesn’t require any canning expertise. With just a few jars, a good brine, and some spices, you can “quick-pickle” practically any fruit or vegetable. Unlike with traditional canning, you don’t need to take any precautions against foodborne illness, and your pickles will be ready to eat in just a couple hours. Here’s how to do it in just five easy steps. You can pickle just about anything: beets, cauliflower, onions, eggplant, corn, grapes, lemons, watermelon rinds, pears. Go ahead and experiment! If you’re using particularly tough veggies like Brussels sprouts, beets, green beans, or carrots, you might want toblanch them quickly in boiling water to soften them up first. This step isn’t essential, but some home cooks say it yields a better texture and flavor. It’s generally best to pickle each item in its own separate jar for a couple of reasons. First, firmer items like carrots pickle more slowly than softer, delicate options like onions or grapes. And second, red or pink vegetables like beets and red onions have a tendency to turn things pink. A simple blend of vinegar, water, salt, and sugar, pickling brine is the key to achieving that classic tangy, briny flavor. Vinegar is the key, and most recipes call for plain white, but apple cider vinegar or white wine vinegar also work. Avoid balsamic or other flavored vinegars, which are too syrupy. 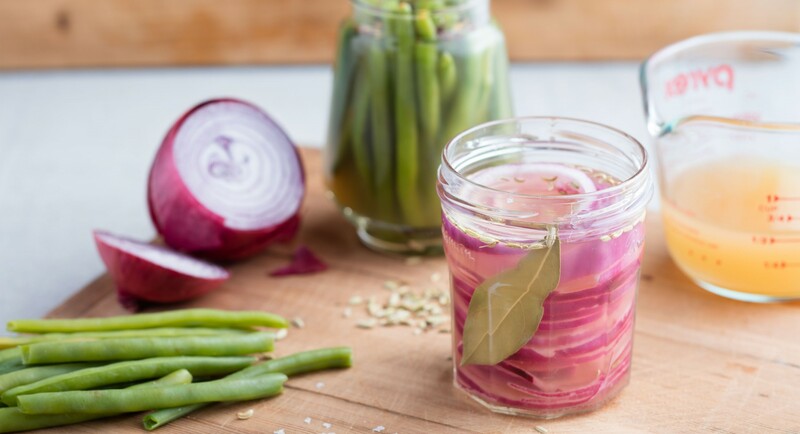 To make your brine, combine 2 to 3 cups each of vinegar and water with 2 tablespoons kosher salt and 1/4 cup sugar (adjust the amount if you prefer saltier or sweeter pickles). Bring to a boil in a saucepan over medium heat, stirring frequently to dissolve the salt and sugar. As soon as the brine boils, remove it from the heat. Place the vegetables in a heatproof container—we like mason jars, but bowls work, too—and pour the brine over. The brine should comfortably cover, but not swamp, the veggies. Allow to cool uncovered at room temperature. Though a plain vinegar solution does the trick, adding herbs and spices really pumps up the flavor. Classic cucumber pickles typically rely on a few usual suspects: peppercorns, mustard seeds, and bay leaves. That’s not to say you have to limit yourself to this trio—any spice you like can go in the jar. Once the jars have cooled to room temperature, cover and place them in the fridge to rest for at least an hour, while the fruits or vegetables absorb the brine. If possible, let everything pickle for a few hours or overnight before tasting—the longer they sit, the more the sweet-and-sour flavor will deepen. Since we’re quick-pickling, and not technically “preserving” with this process—store the finished product in the fridge and try to eat your pickles within 10 days. Serve classic dill spears with sandwiches, make your own crudite board with preserved carrots and eggplant, or top Greek yogurt with tart pickled peaches and a drizzle of honey for a new twist on dessert.